The first recording of Jake’s choral music is performed by the spectacular John Alexander Singers and the great American mezzo-soprano, Susan Graham. 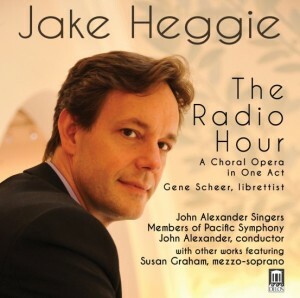 It features the premiere recordings of Heggie & Scheer’s choral opera, The Radio Hour, as well as settings of texts by Dickinson, Amy Lowell, and the hymn from the opera Dead Man Walking. For more information about the composition, see THE RADIO HOUR (2014).